Most ankle arthritis is as a result of what is known as “wear and tear” (or osteoarthritis). Other forms of ankle arthritis exist which can effect the ankle such as inflammatory arthritis, an example of which would be rheumatoid arthritis. Compare to the normal ankle x-ray. The joint space is narrowed(1), there are outgrowths of bone around the joint(2), the bone beneath the joint surfaces is thickened and dense(3). These are common features of all arthritic joints and are not specific to ankle arthritis. The inside of a normal ankle joint is lined completely by smooth cartilage which looks very like the covering of the joint one sees with a chicken drum stick for example. The arthritic ankle loses this smooth cartilage lining which normally allows for low friction and pain free weight bearing. 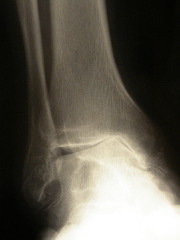 Once lost, the underlying bone is exposed in ankle arthritis. 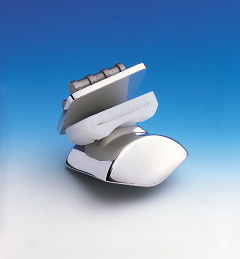 This is not a comfortable surface for weight bearing and pain is generated from inside the joint. As well as losing the smooth cartilage lining in ankle arthritis there are other secondary changes which occur in the joint such as the development of painful, red, inflammed soft tissue known as synovitis which also can produce pain in ankle arthritis. As the cartilage is being “worn away” in ankle arthritis loose flaps of cartilage can become partially detached from the arthritic joint and these can also produce pain and also sometimes a sensation of locking from the arthritic ankle joint. What symptoms might I have with ankle arthritis? It is possible that in the early stages or even in the “late” stages of ankle arthritis that one may experience little in the way of symptoms. Most commonly pain is the presenting symptom and in ankle arthritis this is usually well localised to the level of the ankle joint. It can be felt anywhere circumventially around the ankle joint but usually it is felt deep within the joint. The intensity and duration of pain from an arthritic ankle varies significantly person to person and at different times. Generally, early symptoms in ankle arthritis are pain and perhaps swelling, after prolonged weight bearing or high impact type activities. If the ankle arthritis progresses then pain can become a more frequent occurrence and provoked by progressively less and less activity. Eventually pain can become present most of the time, even when non-weight bearing or at night in bed. Other structures around the ankle can also produce pain. If pain is located at the back of the ankle consider the Achilles tendon (or Achilles tendonitis) as being a possible source of symptoms. For more information on Achilles tendonitisplease select the phrase and the link will take you straight to the relevant section within the website. There are also other joints in the immediate vicinity of the ankle joint which if they are arthritic can produce pain in a similar location to ankle arthritis. Specifically these are the subtalar joint (beneath the ankle) and the mid foot joints of the talo-navicular and calcaneocuboid. Deformity can also be an occurrence in ankle arthritis. This may be chronic swelling around the level of the joint or an inwards tilt (varus) or outwards tilt (valgus) which occurs at the ankle joint, in particular on weight bearing, often due to asymmetric loss of the weight bearing surface of the joint. There is a great deal of individual variability in the level of symptoms from ankle arthritis and also the rate at which it progresses. Generally, one should base one’s treatment upon the level of symptoms that the ankle arthritis is currently giving as opposed to any extrapolation of how severe the symptoms from ankle arthritis might be in the future. Ankle arthritis is commonly the result of either a direct injury into the joint such as an ankle fracture or the result of a longstanding and symptomatic ankle instability. Occasionally it may occur secondary to chronic and recurrent inflammation such as with rheumatoid arthritis, gout or the recurrent bleeding of haemophilia. Rarer causes of arthritis may be secondary to a neurological condition such as polio or hereditary sensory and motor neuropathy. The resulting ankle arthritis is treated in the same fashion, whatever the underlying immediate cause. There are a large number of other causes of pain from the ankle other than ankle arthritis. 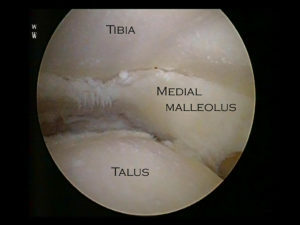 Examples are conditions such as an osteochondral defect, synovitis of the ankle joint, a chondral injury of the ankle joint, arthrofibrosis of the ankle joint and avascular necrosis of the talus. It is also important to bear in mind that the more superficial tissues around the ankle joint, in particular the tendons such as the Achilles , Tibialis posterior and flexor hallucis longus may also produce pain in the vicinity of the ankle joint. Anatomically the ankle joint sits very close to the sub-talar joint. Situations exist where both ankle arthritis and sub-talar arthritis are present and it is important to distinguish the two. It can sometimes be difficult by examination and plain x-ray to tell which the relevant joint is. Under these circumstances it can be useful to inject local anaesthetic and dye into the joint under question to see whether this produces temporary relief and therefore identifies the joint directly as being the relevant one which is producing pain. If I have been diagnosed with ankle arthritis how can I help my symptoms? The general things which one can do which are helpful for arthritis in all lower limb joints are to ensure one is not carrying excess weight, reduce heavy impact activities on the joint, use occasional non-steroidal anti-inflammatory tablets as required. A lightweight and stiff soled walking boot can also be useful in relieving symptoms of ankle arthritis. The sole itself should be too stiff to flex and run with a gentle curve from heel through to the toe, a rocker type sole.Our advice before going down the route of expensive, customised shoewear would be simply to try a stiff soled hiking boot, such as those that are manufactured by Meindl, Scarpa, Brasher or Merrill. Another key feature if using the boot to alleviate ankle arthritis is that the upper should be stiff and sit well above the ankle. Conservative (non-operative) management can certainly be useful in the early stages of ankle arthritis. Physiotherapy can help by strengthening some of the muscles around the joint but generally ankle arthritis is a difficult condition to treat successfully with physiotherapy. The problem with treating the arthritic ankle with physiotherapy is that the joint is often stiff and painful and the muscles around the joint relatively wasted. All of these factors make improving the situation with physiotherapy difficult. Injections of steroid and local anaesthetic into the joint can help for shorter periods of time but tend to need to be repeated. Orthotic management can be very useful for ankle arthritis. This involves both using a rigid plastic splint which runs from behind the calf down on to the foot (an AFO or ankle foot orthosis) combined with the use of a shoe or boot with a stiffened sole with a gentle curve from heel to toe, a rocker sole.The splint blocks the normal ankle range of movement, reducing the force through the joint and irritation of the painful joint surfaces. The rocker type sole will then compensate for this movement, which has been deliberately blocked. Before proceeding with ankle arthroscopy for arthritis, it is important to realistically way up the pros and cons with your Clinician. There is a chance that you would need more extensive surgery shortly after this initial procedure if you fall into the 5% bracket of symptoms getting significantly worse. The commonest surgical treatments for the severely arthritic ankle are either a fusion or a joint replacement. In less advanced or less symptomatic cases other surgical managements may work. To find out more about ankle fusionplease select the phrase and the link will take you straight to the relevant section. There is no precise definition of severe arthritis and a persons appreciation of pain, the commonest complaint in arthritis, is very subjective. However a clear example of severely arthritic symptoms would be ankle pain, continually present, restricted walking to 15 minutes only, little response to painkillers and little change or worsening over a number of months. Often, though not invariably, such symptoms are associated with advanced x-ray changes such as loss of the joint space, thickening of the bone and outgrowths of bone around the joint known as osteophytes. Ankle fusion involves preparing both sides of the joint back to healthy and bleeding bone. The arthritic joint lining is removed and the ankle joint is placed in a functional position and held there until the bone has grown across the joint and the ankle is thus fused. The ankle is held in position whilst the fusion is occurring and this is most commonly done with large screws which are buried beneath the skin. Occasionally a large metal rod may need to be inserted through the heel to compress the ankle and sub-talar joints (known as a double fusion). In cases where infection is present a device known as an Ilizarov frame may be used to compress the ankle joint and hold it in position until fusion has occurred. On average it takes three months for bone to be fairly soundly fused but on occasion it can take significantly longer. Ankle fusion for ankle osteoarthritis is a good option for younger and more active patients. A return to heavy manual occupations and potentially also sport is possible. A return to sport after ankle fusion is largely determined by the mobility of the compensatory joints which are left intact. Ankle replacement involves replacing the two worn out surfaces with replacement highly polished surfaces and adding a high molecular weight polyethylene spacer between the two surfaces. Ankle replacement generally maintains the range of movement which a patient has pre-operatively. It is not suitable for heavy manual or sporting activities and probably has a ten year survivorship in the region of 85%.